This page provides background information for the post “By 2050 we will save the rain forest eco-systems“. Much of this idea was inspired by trips to Sabah in Borneo. I have visited various parks and reserves there. On one trip I took this blurred picture of a monkey. Around the same time I was bitten by an insect on the elbow. I took five courses of antibiotics before the elbow reverted to normal. The reserve where I took the photo was smaller than the adjacent golf course and a thousand times smaller than the nearby oil palm plantations. Which all illustrates why we struggle to retain rain forests. The problem is that rain forest generates no income. In fact it is a nuisance, full of unpleasant insects. Tourists do not want to be bitten by mosquitoes, ants, leeches or snakes, so many stay away. Those that appear want designer animals, close enough to photograph, not a blurred monkey legging it up a tree. In fact most rain forests appear to be empty, because animals have learned to hide from humans. Tourists demand a sanitised rain forest experience, with animals and birds selected, or even tamed, so that they are available to be viewed. A sort of in-situ zoo. A nice small reserve meets this requirement well. On the other hand the palm oil plantations are huge because they generate serious money. Palm oil annual yields are around 3.5 to 5 Tonnes per hectare (100metres square). Palm oil prices are around $800 per tonne. Suppose we wanted to save a rain forest area in Borneo that was 10 kilometres square (6 miles square). That size of forest would probably provide a good home for some largish wild animals such as orang-utans. The landowner could earn around $30M to $40M per year by burning that forest and growing palm oil. Some of that money buys the landowner a nice house and car, some goes as tax into schools and hospitals, some provides much needed employment for plantation workers. To make the landowner retain the land as rain forest we need to provide a better deal than that. These figures may be high because the Borneo plantations are very productive. I’m told that Amazon rainforest is less productive and output tends to collapse as the soil washes away. Presumably the market price for retaining rainforest would be less but I do not have that information. The prompt for my ideas on broadcasting was a headline that BT recently paid £300M (around $450M) per year to broadcast Champions League Football matches in the UK. I wondered whether it would be possible to generate that kind of income from a rain forest. I think technology development could be very helpful. The experience would be improved by some degree of user control rather than just watching a fixed screen. For example could viewers use I-Pads to look around in the rain forest? Maybe the live experience could be made 3D. To make things even better, in a few years we may all have immersive technology, with all round vision and Hifi sound. We could both look around and control the motion of the camera through the forest. Maybe groups of people could journey into the forest together – a virtual safari. The sketch in the post shows this. 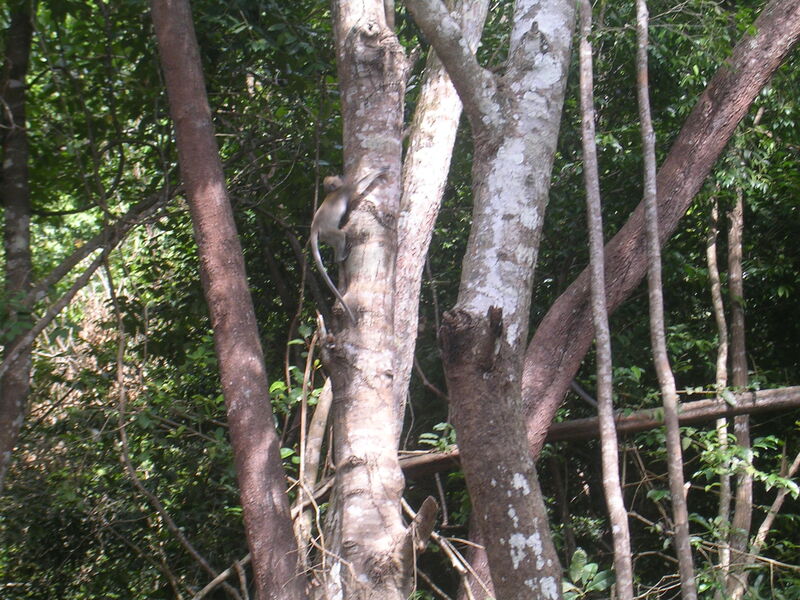 I think that photographic clubs may pay to operate top quality cameras in the jungle and seek the best photographs. They, and others, would want to use powerful lenses to photograph insects. I also saw the launch of a new play console. Many of the games are shooting games. Would young people pay to have the opportunity to ‘shoot’ real animals in a real forest? For example they could compete to see who would be the first to ‘shoot’ a real tiger. Could that be done through a play console? The sketches assume that the cameras are on tracks. That would allow control in one dimension. The greater the control, the better the experience. Could cameras be on manipulators? so they could move in space near the tracks? Could robots act under remote control and walk through the forests looking for targets? A disappointing aspect of the proposal is that it is unlikely to save huge tracts of rain forest. It could save representative areas, which would be valuable in some countries, for example in the south East Asian countries where pressure on land use is high. A 10km square patch would be much larger than some of the reserves I have seen. That might allow regrowth in future into plantations if the soil was still suitable. For large rain forests such as the Amazon the idea would provide some useful stores of bio-diversity, which is useful, but falls far short of an ideal solution. Thoughts on that issue are welcome. How much would people pay? For comparison Sky Sports costs around £22 per month, or $400 per year. The number of subscribers is not released publically but is widely believed to be in the millions (source BBC) from a UK population which is only around 1% of the planetary total. I assumed $400 in the post as an average annual payment. For simply viewing the figure would be less. For control of a camera the fees may be higher. I assumed 100 million subscriptions to these services. It is slightly over 1% of the world population in 2050. That strikes me as a conservative assumption. Given that most of the world will live in cities I imagine that interest in nature will increase. These media based services from the rain forest will be much more vibrant and interactive than those available today. The service providers will market these things actively, which will increase demand. Young people will want to do something with their technology. This will be exciting and will benefit the planet. I recognise that the broadcaster and others will take a cut of the subscription takings. I’m not sure how big that cut will be. However when sports are broadcast a significant percentage seems to get back to the clubs and players. I assumed that half of the nature subscriptions would get back to the rain forest owners.